The Wedding AlBUM! March 28-29! I am recording my next comedy CD, and my first comedy DVD, The Wedding AlBUM on March 28th and 29th at Austin's The Institution Theater. The past few weeks have been exciting! I've had meetings. I hired a great production crew. I edited a great promo video to help get support for the project. 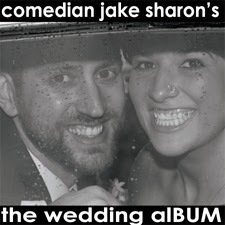 I have been headlining all over the country tightening up the set I'll do for The Wedding AlBUM CD/DVD. I am so psyched and so ready to rock The Wedding AlBUM! To help fund the The Wedding AlBUM, I created a Kickstarter Project. Your contribution of even a dollar will help pay for the production crew, editing the CD/DVD, replicating the CD/DVD, and more. BTW, I was actually pretty surprised how much work that took to set up my Kickstarter. However, my friend pointed out that if it didn't take a lot of effort, imagine how many other Kickstarters there would be! Good point! PRIZES/ WEDDING GIFTS FOR YOU! This is one of the most exciting parts of my the Kickstarter project! I have been coming up with all kinds of awesome "wedding gifts" to give my contributors. Of course, the CD/DVD is the most obvious reward. That's the whole reason I am doing this. I love my wife. I have turned that into comedy. And I want to share that comedy love with you. The CD and DVD (hardcopy and/or digital download). The background from the CD/DVD recording. Producer credits on both the liner notes and scrolling at the end of the video. The chance to have me read whatever message you want -to whomever you want during the CD/DVD recording. This recording will be on the CD and the DVD! I'll fly to your town and perform your own special, private comedy show. As of half an hour ago, you can now help fund The Wedding AlBUM. Please click here. Your support will be greatly appreciated- and rewarded! P.S. Please contact me with any questions!